Are you ready to contribute to the world in a lasting and meaningful way? Will you build society up and ensure that future citizens will enjoy their lives that much more? How can you do that? Well, there is a simple route… and one that even allows you ready access to some of the most personally fulfilling experiences you could ever have. Have you considered… going to the YMCA!? Everyone wants to go to the YMCA. That’s a truth that very few question, usually because they cannot help but to start singing and dancing to the obvious fact! Police officers, construction workers, army folks… even movie inspired cowboys and indians flocked to become a part of each, frequently singing out their interests! It was then that we realized the connection: the Village People! Those dastardly darlings were seducing the world with their combination of disco-fever powers and delicious duds. How did they manage such potent compulsion? Well, it depends on who you ask. Some point fingers right to the leather clad biker boys, but there is something dangerously tempting about Randy Jones, the black hat bandit cowboy. Hey, they both wear leather, and who can resist that!? Ha! Of course, the most powerful ad amazing of the Village People is the one who can build our future and look amazing while doing so! The construction worker, obviously, was the most masculine and mighty of the crew. The only debate is if David Hodo or Mark Mussler was the epitome of the construction man! 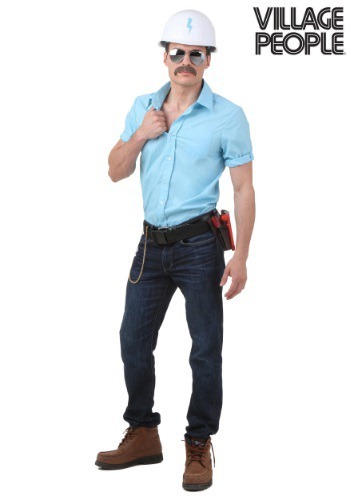 You, too, can wield this power when you transform with this officially licensed Village People Construction Worker costume. This seemingly simple short sleeved wing collar shirt buttons up like one might expect, though the hard hat with the adjustable liner and shining silver wire frame glasses begin to put the work into the construction worker. Of course, what Village People member would you be without the adhesive mustache that completes the look and will have you rocking the stage down. Join up with the other member and you’ll be serving up the whole stage of masculinity!